New Zealand are just 1 step away from qualifying for the semifinals as they secured their second World T20 win against Australia on Friday at Dharamsala. 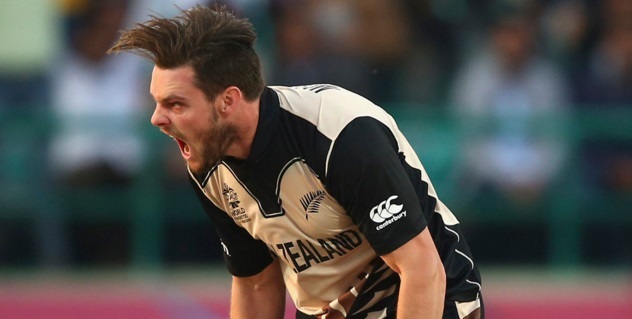 Mitchell McClenaghan was star of the show as his three over spell yeilded three important wickets for New Zealand as they restriced Australia to 134 runs and won the game by 8 runs. New Zealand won the toss and elected to bat first on a pitch which had assistance from both fast and spin bowling. New Zealand were given a superb 61 runs opening stand by Guptill (39 of 27 balls) and captain Williamson (24 of 20 balls). But kiwis failed to take full advantage of a such a good start as their middle order crumbled and they could only score 142 which was very achievable for a such a strong Australia lineup. 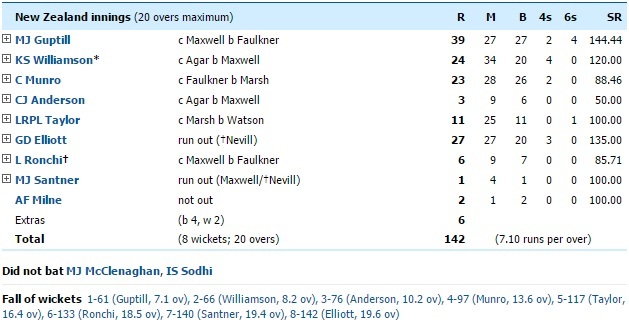 Shane Watson (13 of 12 balls) and Khawaja (38 of 27 balls) added 44 runs in first 5 overs as Aussies looked to have game under control but they lost their way when 4 wickets fell in next 5 overs. Maxwell and Marsh provided some stability in the middle overs to bring Australia close to the target. 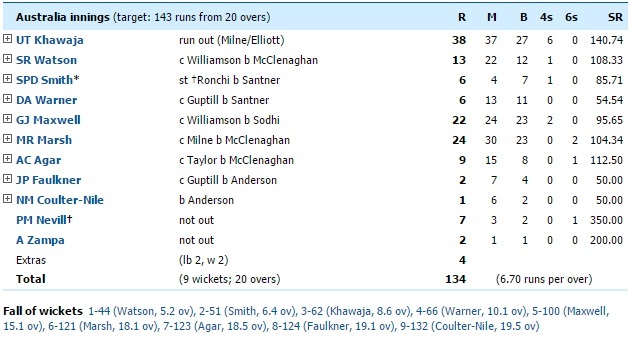 Needing 22 runs in 12 balls New Zealand McClenaghan took two wickets in 19th over and only gave away 3 runs and that proved to be a the final nail in the coffin as Australia failed to score 19 runs needed in last over. New Zealand now has won both of their opening games and realistically need just another win to qualify for semifinals. Mitchell McClenaghan was named man of the match for his impressive three wickets haul at a crucial stage when it looked Australia will do just enough to the win the game. New Zealand has both their opening games batting first with low scoring games. Their batting has not clicked yet but a very mean bowling unit is backing up where batting is struggling. Aussies won’t be happy with their batting performance towards the end of the inning when they pretty much threw away the game after a great start.